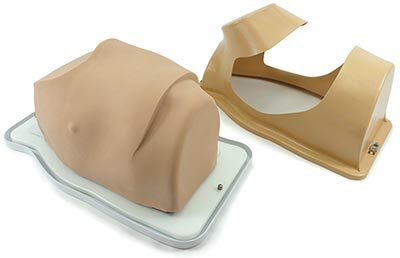 Provides a realistic human thoracic context for lifelike VATS training with porcine tissue explants. Derived from patient CT data, the VATS Trainer for Explants Left-Sided is a hemi-thorax with all pertinent landmarks for thoracoscopic lung surgeries. The trainer presents a patient in a lateral decubitus position with exposed anterior and posterior thoracic wall. The replaceable skin/muscle element supports trocars and is comprised of our renowned mimetic tissue. Ribs may be palpated beneath the soft tissue for procedural port placement. The trainer is equipped with a tray to capture tissue effluence and is easily disassembled for cleaning. Designs, develops, and manufactures accurate anatomy for surgical and interventional training, research, device development, sales and marketing.